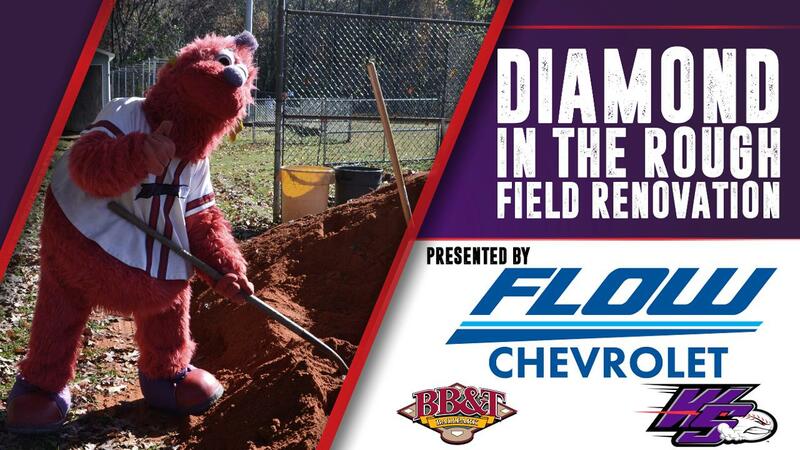 WINSTON-SALEM, N.C. (Sept. 21, 2018) - The Winston-Salem Dash are partnering with Flow Chevrolet for the fifth consecutive year to hold the 2018 Flow Chevrolet Diamond in the Rough Ballpark Renovation, during which one local baseball field will be selected to win a Major League makeover. Area Little Leagues and softball leagues may submit videos to the Dash's social media accounts on Facebook, Twitter, YouTube or Instagram, showing why their field is in need of renovation. Entries will be accepted through October 12th. Flow Chevrolet and the Dash will select a winner to be announced in mid-to-late October. The Dash grounds crew will head to the winning site to refurbish the field in early November. Representatives from the selected field will also be recognized at BB&T Ballpark during a 2019 Dash home game. In 2014, the Dash and Flow Chevrolet partnered for their inaugural field renovation at South Little League (SLL) in Winston-Salem. Other recipients include Winston-Salem National Little League in 2015, Northwest Forsyth Little League in 2016 and Parkland High School in 2017.